To pay or not to pay, is THAT the question? Forrester just released a report titled "Add Sponsored Conversations To Your Toolbox," authored by Sean Corcoran. What's interesting is how Forrester is pretty deliberately putting this approach into a category of its own, alongside it's predecessors or cohorts (depending on your position), advertising and P.R. and in doing so, plays a part in terms of legitimizing or formalizing an emerging practice. His colleague Jeremiah Owyang covers it here and Brian Morrissey at Adweek covers it here. Marshall Kirkpatrick from ReadWriteWeb takes a strong counterposition here. I was interviewed for this piece by Sean, as was Chris Brogan, who participated in the aforementioned Kmart program, sits on the board of IZEA - the company behind the program (and the one formally known as PayPerPost). Chris responds specifically to Marshall with this post. Here's the thing. In my time in this space thus far in a formal capacity (i.e. crayon), I've worked on two pretty public and well received programs: My ooVoo Day and the Panasonic CES program. In the former example, both Marshall and Chris were participants; in the latter one, Chris was one of the bloggers. I'm not sure I would call either of these programs "sponsored conversations". In fact, crayon calls them "tactical hooks" - a mash-up of the best (practices) of the advertising and social media worlds. Put differently, we believe that influencer outreach should be treated with the same consideration, commitment and investment as a traditional communications program from both a planning and production standpoint. It's imperative to give influencers both a reason to believe and a reason to behave. Too often, we are lazy, greedy and gratuitous in terms of what we expect from bloggers and the like and essentially what we expect back from them, relative to what we put in, in the first place. In a personal capacity, I've participated in both the Nikon D80 giveaway and the Sears program (part 2 of IZEA's Kmart 1-2 punch). In both cases, I wouldn't say this remotely smacked of PayPerPost; nor would I say my conversation was sponsored. In some respects,this is no different than a "celebrity" (TRUST me, I'm using that loosely) sponsorship - from loaning a star diamonds on Oscar night to adorning Tiger Woods with a cacophany of swooshes in exchange for mega moolah. I guess the point is where on the continuum does blogger or influencer outreach fall. Personally, I believe we should be calling this "blogger/influencer outreach" and not "sponsored conversation". Let me also be very clear (and you can see from the definition), that I don't think Sean meant this to be taken in a negative light. I spoke with him and we had a great conversation. I think the real ambiguity and problem lies with us (i.e. the readers of the report; the commentators and so called social media experts etc). Part of the problem lies with the fact "sponsored conversation" sounds a bit like "paid search" does it not? Putting two terms which seemingly mean exact opposites together and in doing so, creates a rather jarring disconnect. Part of the problem as well lies in the endless, boring and inaccurate comparison between the new class of content creators (bloggers if you wish) and journalists. They're not...at least for the most part. Should bloggers be compensated in any way, shape or form for their time, effort, energy, passion and contribution. The answer can only be a resounding YES, with standard terms and conditions (disclosure, transparency etc) which make both common sense and business sense. Is expecting bloggers (in return for aforementioned compensation) to write, talk, post, create etc about their experiences, reflections, ideas, participation crossing a line? The answer here is a resounding NO, provided there is adequate disclosure and transparency. Come on people. Grow up and wisen up. This is a nascent industry and space which is learning and maturing all the time. What we have here is in many respects no different to how the world was, but in many respects is also incredibly and completely different. It's time to get off our high horses and open our minds, instead of stubbornly holding on to and exhibiting self-righteous, hypocritical and close-minded positions. Whatever you call them, "sponsored conversations" are here to stay. And just like the vast differences between crap and mediocre creative (lumped together) and inspiring/breakthrough creative, so too will there be a marked difference between influencer programs that stand out from the crowd or get trampled by it. How much does this hotel love their customers? 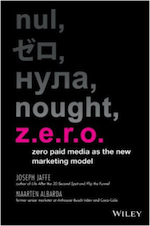 New category on Jaffe Juice: New Marketing reflections courtesy of my Nikon D80 loaner camera. They say a picture is worth 1000 words, so when I find these moments, I'll snap and share 'em with you. 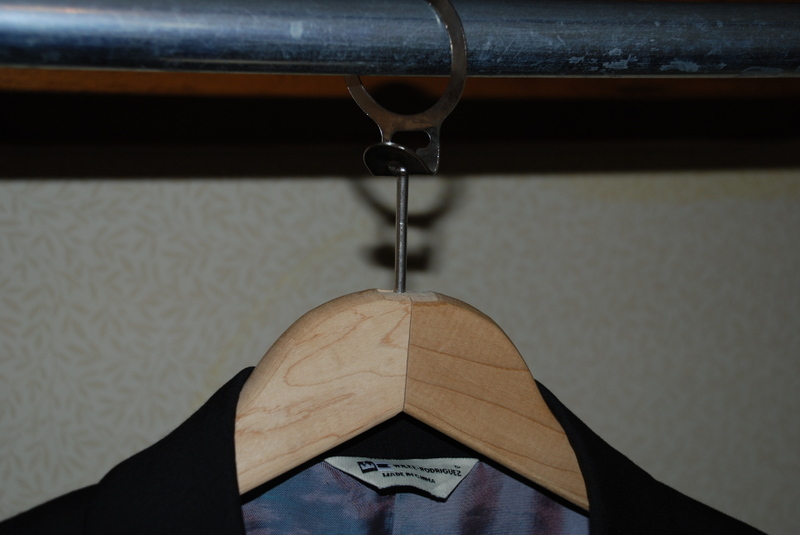 You've all witnessed the hotel that trusts its customers so little that they insure themselves against hanger-theft with these incredibly impractical removable hangers. I don't know about you, but nothing devalues a relationship more than this kind of in-your-face insult. The hotel by the way was the "classy" Deerhurst resort in Huntsville, Ontario. Feel free to leave your own similar examples in the comment thread.